The MP Biomedicals FastPrep 24 Homogenizer is a tool used for isolating stable RNA, active proteins and DNA from tissue and cells by way of lysis. 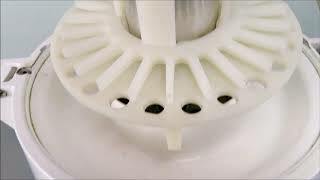 The FastPrep-24 tissue and cell homogenizer works by taking matrix lysis beads and putting them directly into a tube along with the sample which then disrupts the cells through a unique multi-directional motion. The process takes roughly 40 seconds for complete homogenization. By using the FAST Prep 24 from MB Biomedical it will cut down on your time to process sample thus increasing work flow within your laboratory. There are a number of purification kits to choose for sample extraction, purification of proteins, acid, nucleic and metabolites. This system is ideal for any genomics lab looking to increase productivity. Contact us today to learn more about the MP Biomedical FastPrep 24 Tissue Homogenizer. The MP Biomedicals FastPrep 24 has been tested and is ready to ship. The homogenizer has a new door seal and lid sensor and runs like new. Our turnaround time from receipt of order is three business days. The Fast-Prep 24 ships out via freight so please let us know if you need a lift gate at time of delivery. Should you have any questions, or would like to sell your used lab instrument please don't hesitate to give us a call at 617-999-5746.